Headquartered in Bellevue, Washington, Smartsheet.com was started as a Software as a Service (SaaS) company in 2006. Its primary offering is a self-named, enterprise-ready online project management software app that is used by more than 40,000 businesses and 2 million users in over 160 countries. Smartsheet.com’s customers include businesses of all sizes, from small start ups to long-established Fortune 500 companies, along with academic organizations and government agencies. 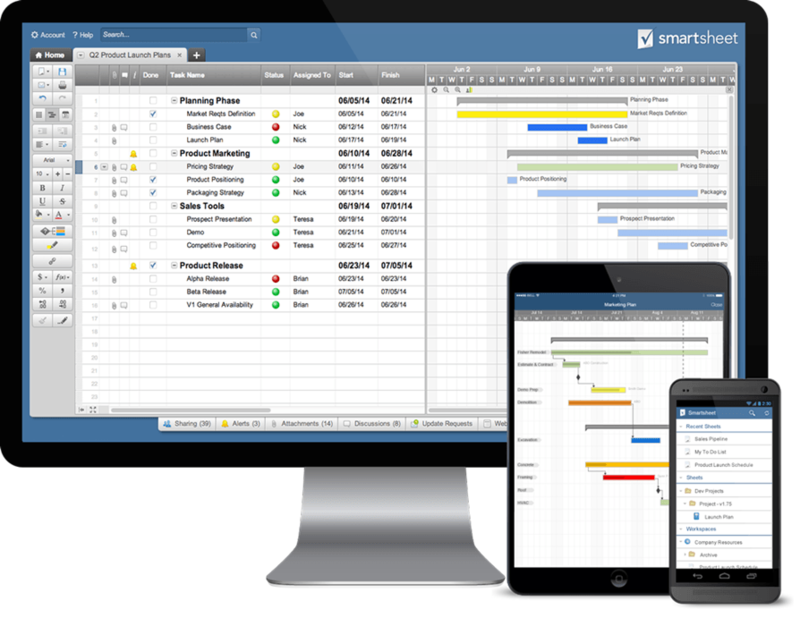 As award-winning online project management software, Smartsheet offers an intuitive spreadsheet-like platform that can be used to track and manage diverse types of work data including projects, task lists, customer information, sales sources, events and schedules, business processes and more. This easy-to-use project planning software solution is integratable with numerous other services, including Google Apps, Box, Dropbox, VMware, Amazon Web Services, Salesforce, and Zapier. In Smartsheet, files can be imported and shared with other team members, encouraging real-time collaboration, and resources can be managed with real-time team allocation. Another feature of this project management software is the customizable and interactive Gantt chart application, which allows members to highlight tasks, visualize complex data, and more. With Smartsheet, users can track budget and project performance on one sheet. Use the software to compare estimated and actual labor, materials, and other costs and assign task. A unique feature of this application its its cell linking capability. Users can combine several project links into one master, or summary, page by linking cells across sheets and when information is updated in the subsheets, the master page is automatically updated as well. In addition to being easy to use, this online project management software is scalable to almost every organization and process, and it’s secure while still allowing clients the flexibility to work through a mobile application. Compare Smartsheet with other project management software using our Project Management Product Selection Tool. Got questions? Call, click, or email to speak with an unbiased Technology Advisor for a no-cost, no-obligation consultation on your unique requirements. Learn everything you need to know about Smartsheet. Our experts will reach out to you shortly.